Originally designed by Sir Joseph Paxton, the iconic Crystal Palace is now poised to become one of South London's newest major developments. Built in 1851 to house the Great Exhibition which featured a massive 14,000 exhibitors, the structure was first located in central London's Hyde Park. The building originally offered 990,000 square feet of space and after the exhibition, was dismantled and relocated to the estate of Penge Place at Sydenham Hill in 1854. Once rebuilt and enlarged even further, the new 200-acre Crystal Palace included schools specialising in art, engineering, literature and science. Crystal Palace also hosted the first ever cat show, 20 FA Cup final matches and was the original location of the Imperial War Museum. During the First World War, it was used to train members of the Royal Navy. The super-structure of its time could be seen from great distances due to Sydenham Hill being one of London's highest land areas. Today, the area is often referred to as Crystal Palace Park and is home to the National Sports Centre which hosts important televised sporting events throughout the year. The grounds have been featured in films and used for concerts – Bob Marley notably played one of his last dates at the venue – although all that remains of the original Crystal Palace structure today are the Italian style steps and terraces. "Engulfed in a roaring sheet of flames, which towered so high into the night sky that it could be seen almost from the English Channel, the world-famous Crystal Palace, architectural pride of the Victorian era, crashed to the earth tonight a raging inferno of twisted girders and molten glass." The 1936 edition of the London Fire Journal reported: "A man named Henry Buckland and his daughter Crystal, named for the London palace, were walking with their dog when they noticed a small fire and sounded the alarm. The flames spread swiftly, engulfing the structure – and prompting London Fire Brigade commanders to summon a total of 88 fire engines and 438 firefighters, including some from neighbouring cities, according to the BBC". Additional reports stated that: "Within a half hour, the great arcade of glass, towering 175ft, collapsed, sending up showers of sparks and blazing embers. Then as if drawn by a flue the flames swept the whole length of the nave. The first fire alarm must have been turned in soon after the blaze was discovered, for neighbouring fire brigades arrived before the flames had begun to reach their fury. But efforts to check the spread were futile, as were those of London's most powerful fire-fighting forces, which were quickly notified and sped over all bridges leading to the south bank of the Thames." Shortly after the first started, thousands of local residents gathered to watch the structures demise with hundreds of police officers summoned for crowd control. It was also reported in the London Fire Journal that others viewed the fire from rooftops and Members of Parliament watched from committee rooms and terraces. The Duke of Kent went to the fire lines dressed as a firefighter to view the situation. The actual cause of the fire was not determined but was believed to be accidental. On 3 October 2013 a press event featuring Mayor of London, Boris Johnson was held to launch the new £500m scheme to rebuild Crystal Palace to its original Victorian design. Mayor Johnson said the plans are "of the highest quality, sympathetic to this much-loved heritage site and fit for the 21st century". Also at the event was Ni Zhaoxing Chairman of Chinese investment firm ZhongRong of Shanghai who are funding the development. He described the project as a "once in a lifetime opportunity" to bring the palace "back to life". "I want to make Crystal Palace a jewel in the crown for the UK and for the world. It should be an artistic place and it must be an artwork of construction itself." Zhaoxing added, "London is renowned across the world for its history and culture and the former Crystal Palace is celebrated in China as a magnificent achievement". To protect any future development of the site an Act of Parliament was passed in 1990 requiring that any construction on the site should 'contain a predominance of glass and metal or similar materials and that the building should reflect the spirit of the original Crystal Palace'. 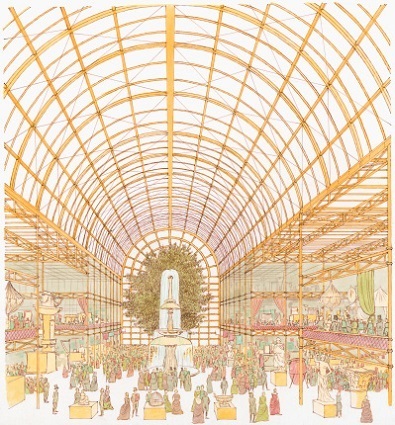 Plans for the new development are of the same size and scale of the original Crystal Palace which was the largest glass structure in the world in its day. 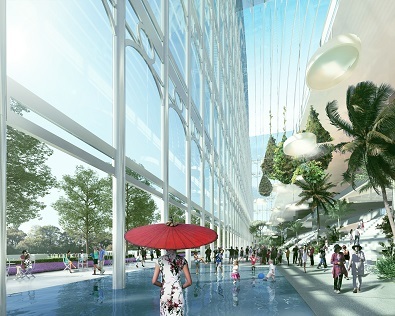 The new building will be used for cultural events, concerts, exhibitions, movie screenings, conferences and conventions, creating more than 2,000 permanent and temporary jobs as well as attracting investment in to the local consumer shopping market. Like so many of these large-scale property developments there is opposition to elements of the scheme especially in protection of 'green' areas. In a BBC interview, Green Party member Darren Johnson said it was a "poorly-timed" proposal. He said: "While I'm sure many people would love to see the Crystal Palace raised from the ashes, this precious parkland isn't the right place for it. 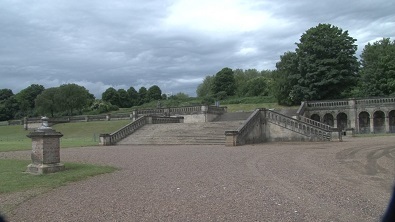 When the palace was moved there in the 1850s, the newly laid-out park was near countryside but today it's an urban park with a lot of space already taken up by the national sports centre, car parks, roads and the caravan site." Other comments included Nick Goy 52, a gardener who was among the protesters at the Boris Johnson and Zhaoxing press conference said to the Daily Mail: "Parks are for people not for profit. We're concerned it will be a commercial operation, take away grass and trees and change the nature of the park. When the original palace was built, it stood in the countryside. Now London is a very different place. It has expanded and we have very few green lungs like this left." As for vehicle and pedestrian traffic, Labour's Val Shawcross said: "I would be particularly concerned about the impact of two million additional visitors per year on local transport and road networks." 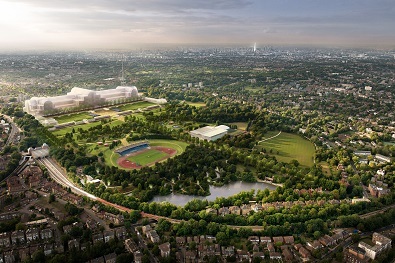 The formal plans for the new Crystal Palace are expected in the last few months of this year. Upon approval, construction would begin at the end of 2015 with completion expected in 2018.